There is considerable room for improvements in the pro-environment behaviors, levels of awareness, and degrees of engagement, among members of the University community. Nonetheless, positive changes have occurred over time in individual efforts to reduce waste. Students’ mode of travel to and from campus is more in line with the goal of greenhouse gas reduction than the journey to work of staff and faculty. Not surprisingly, students are most likely to walk, bike, or bus to campus. Similarly, students know more than employees about transportation options available to them in Ann Arbor. Yet, student understanding of these options has declined over time. Reliance on the automobile in the journey to work of staff has increased since 2012. At the same time, their understanding of alternative transportation options has declined. Faculty are more engaged in pro-environmental behaviors than students or staff. These behaviors include reducing waste and purchasing sustainable foods. Faculty members also express a higher degree of commitment to sustainability than staff or students. Sustainability engagement outside the University has increased among students, staff, and faculty. More individuals are now voting for candidates with pro-environmental values, donating money to such candidates or to environmental organizations, and volunteering for an environmental organization. Seniors participating in the panel of undergraduate students have a greater level of understanding of U-M’s sustainability initiatives in 2018 than they did in 2014 and 2015. They also express a greater commitment to sustainability. At the same time, seniors are now more critical of what U-M is doing to create a more sustainable campus. 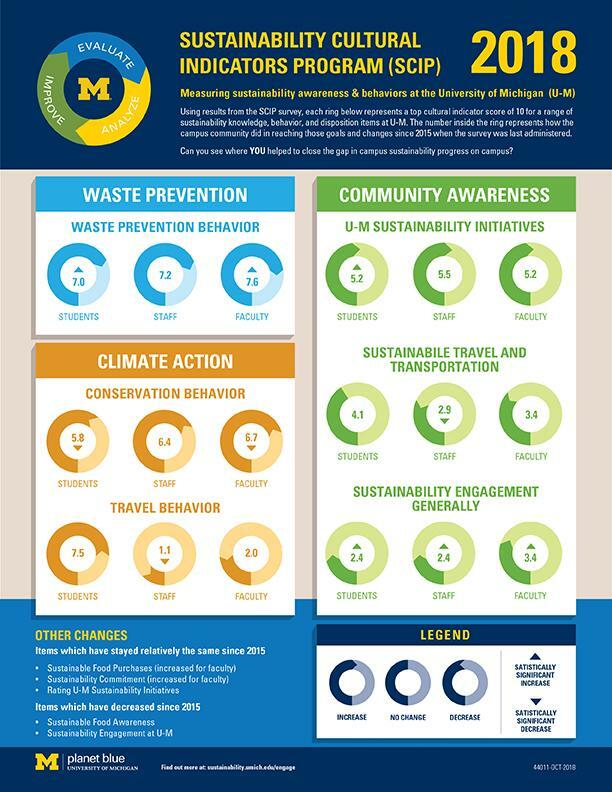 Waste prevention practices of undergraduates who entered U-M in 2014 and 2015 have improved over time. Over the same time period, their efforts to conserve energy have declined. Staff tend to know more about U-M’s sustainability initiatives than either students or faculty. Yet students are more engaged than either staff or faculty in sustainability activities on campus. Engagement on campus for all groups is lower than it was in 2015. Nonetheless, faculty and staff express higher levels of commitment to sustainability than they did in 2012. Finally, participants in the 2018 survey are more likely to believe that climate change is happening, that it is caused by human activity, and that it is of greater importance to them personally than participants from earlier SCIP surveys. A composite file showing results for each question for years 2012-2015 & 2018. Follow the link under Other Materials on the SCIP Materials page.